During the 1930s and early 1940s, Swiss watch manufactures were just beginning to innovate techniques and produce watches meant as tools, rather than time-telling wrist adornments. 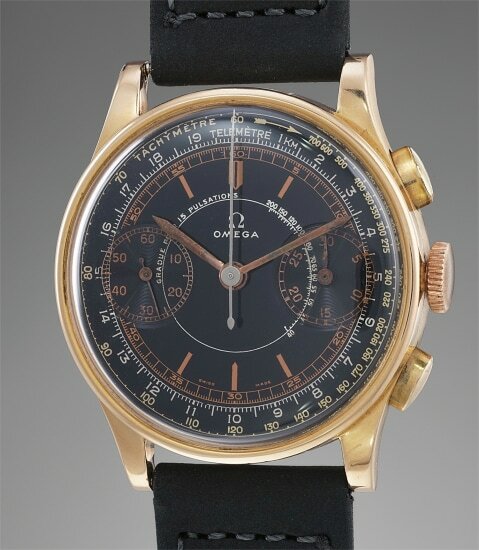 In the early 1940s, Omega excelled in creating multi-scale chronographs, complete with tachymeter, telemeter, and pulsometer scales, that were equaled in their practicality only by their beauty. The present example, cased in 18K pink gold, with a glossy galvanic black dial offset by copper, silver, and gold printed scales, has retained its delicate charisma for over seven decades. Underneath the gorgeous dial beats Omega’s manually-wound chronograph caliber 33.3. Originally manufactured by Lemania and introduced in 1933 as a monopusher chronograph, it was redesigned in the late 1930s and placed within the manufacture’s finest two-pusher chronographs. Research shows the present lot was delivered to South America in 1940. With its well-preserved case, resplendent dial, and charming wrist presence, the present Omega chronograph will certainly be a colorful and exquisite addition to any horological collection.